“Katharsis.” Maxime CORBEIL-PERRON: Atomes (2010); Fragments (2011); Vertiges (2013); Anti (2013); Wise Constellations (2013-14). Kohlenstoff KOHL 015 (1 CD) (http://kohlenstoff.ca/). The best ea defies explanation and labeling. We find ourselves in a world where the familiar takes on varying expressions. Corbeil-Perron juggles recorded and synthesized sounds magnificently. I was transfixed throughout Katharsis, losing track of beginnings, middles and ends. According to its composer, Atomes, “[i]nspired by Japanese minimalist noise music,” blends “sound materials of synthetic and organic nature.” Despite unfamiliarity with the inspiring genre, I nonetheless marveled at the gentle overlay and gradual substitution of soft blips, noise and suggestive electronic gestures. Events may unfold singularly over a pedal, or speed by disorientingly. I tried but couldn’t find a story and hadn’t noticed conventional development. No worries, the 11:46 work sustains attention. Fragments credits a French horn (played by Alice Lane-Lépine) which can be discerned on close scrutiny. Marbled textures pass through space. Vertiges blends siren organ (played by Marie-Chantal Leclair), tape and live electronics. In this guise it works as through-composed. The siren organ appears to be an instrument which permits the strident siren sound customarily associated with warning and peril to have specific pitch and volume, yet the piece doesn’t dwell upon nausea or pain. As all the works here, it’s confidently assembled. The sectional Anti strings together desirable etudes, collected bits and pieces from Corbeil-Perron’s workbench. Wise Constellations illustrates a Paul Klee poem. 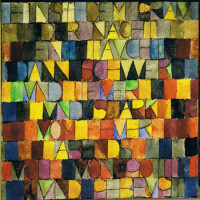 The composer is struck by the notion that Klee often used one medium to describe another, a poem, say, might explain a painting. Extending the association, the music elucidates other aspects. While nothing is overcrowded, it’s neither minimal nor simplistic or slow. 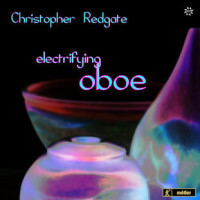 “Electrifying Oboe.” Roger REDGATE: Concerto for Improvising Soloist and Two Ensembles (2009)1. David GORTON: Erinnerungesspiel (2007)2; Schmetterlingsspiel (2009)3. Christopher FOX: Headlong (2007-09)4; Broadway Boogie (1983-84)5. Michael YOUNG: oboe_prosthesis (2008)6. Edwin ROXBURGH: “…at the still point of the turning world…” (1976)7. Matthew WRIGHT: English Landscape Painting (2010)8. Christopher Redgate1,2,3,4,5,6,7,8 (ob, cor anglais, musette), Matthew Wright1,8 (turntable, laptop), Milton Mermikides2, Paul Archibald7 (electronics), Ensemble Exposé1,3: Caroline Balding (vln), Bridget Carey (vla), Clare O’Connell (vlc), Isabelle Carré (fl), Vicki Wright (clar), Mark Knoop (pno, keyboard), Roger Redgate (cond.). Métier MSV 77204 (2 CDs) (http://www.divineartrecords.com/). The modern oboe can sound like a car alarm, or when multi-tracked, like a gaggle of geese. We’re treated to this and more in an anthology of works for oboe and varying accompaniments of instruments, electronics and tapes. Two pieces whose form unfolds variably in performance are given twice: Roger Redgate’s Concerto and Young’s oboe_prosthesis. The Concerto asks its soloist to improvise throughout, starting with clicking and squawking, eventually integrated with a mimicking turntablist/laptop. An included instrumental ensemble (string trio, flute, clarinet and piano) works from a conventional score. In Gorton’s Erinnerungesspiel the soloist busies over copies of itself. Headlong requires that the reed instrument emit simple bouncing beeps as in the earliest computer games. English Landscape Painting combines frenetic oboe over similar primitive tones. Its title must be ironic. This is a specialist set, but a deep trove. “grist.” Efthymios CHATZIGIANNIS: Broken Mirrors (2010). Paul WHITTY: Does the body rule the mind or does the mind rule the body? (2010); Has the world changed or have I changed? (2010). 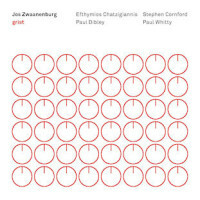 Stephen CORNFORD: Flute Feed (2010). Paul DIBLEY: Organ Grinder (2010). Jos Zwaanenburg (fl). Metier MSV28542 (1 CD) (http://www.divineartrecords.com/). Metier’s bland packaging cannot prepare the listener for an audacious collection for flute and electronics. The flute is no longer silvery and princely, but loutish and coarse. Not recommended if your tastes tend toward dainty. In Cornford’s Flute Feed the instrument doubles back upon itself. At 27 minutes, the program’s longest work is also its most straightforward. Slipping from pitch to pitch, the flute produces long tones fed through a resonating piano. The results are put into a lightly whining feedback loop to which Zwaanenburg must react. Chatzigiannis’ Broken Mirrors asks for customary flute gestures that trigger computer responses and distortion. The synthesized textures pair well with the easily camouflaged live instrument. In comparison, Dibley’s Organ Grinder is the program’s most conventional instrument-plus-electronics effort. The flute remains distinctive amid loops and delays over an accompaniment which clearly has a bass line. All told, the effects suggest circuses and outdoor gatherings. Whitty’s two with their long titles are supremely difficult. Does the body rule the mind or does the mind rule the body? quickly breaks into controlled feedback from which the flute never escapes. Quite possibly the flute isn’t even there. Perhaps you won’t endure 17 minutes of noise which in other contexts indicates something gone horribly wrong. Has the world changed or have I changed? is the easier experience with a more evident flute, though barely. Brave listeners will detect a great deal of detail. 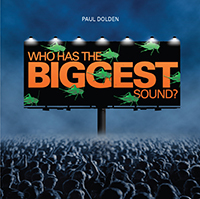 Paul DOLDEN: Who Has the Biggest Sound? (2005-08); The Un-Tempered Orchestra (2010). Starkland ST-220 (1 CD) (http://www.starkland.com/). The title work is a sprawling 52-minute multi-movement canvas from a virtuosic ea practitioner. Real sounds are meticulously layered and interlocked to create a complex scrapbook-like narrative. A single instrument is inked multiple times over itself at different speeds to create a synthetic orchestra. The effect can be dizzying. I took a first pass at Who Has the Biggest Sound? without noting the descriptive movement titles (“The Village Orchestra Poses the Main themes of this Musical Quest,” “Who Has the Nicest Melodies,” “Who Can Talk Faster: Crickets or Man?” etc.). Dolden works his materials with such consistency, including a predisposition to accelerate small events, that it’s possible to overlook the competing categories of materials: instruments and animals. The composer envisions a battle between man and nature. I think I know who wins without recalling the evidence. Annoying narrators puncture the flow. Is the message that man interferes and messes things up? Who Has the Biggest Sound? remains withal a well-meaning field agent’s ethnomusicology report. The Un-Tempered Orchestra plies aggregative techniques, but without nature’s intrusions. Dolden means to explore non-tempered tuning systems and break away from common octave and equal temperament divisions. We’re to admire the innovative if unlikely combinations of genres. Dolden’s own example: Free jazz becomes reworked into ancient Greek, Babylonian and Chinese tuning systems. I guess I missed it. There are six parts, “Orchestra 1” through “Orchestra 6.” Similar to Who Has the Biggest Sound? the rapid patter can be invigorating. 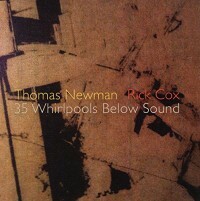 Thomas NEWMAN and Rick COX: 35 Whirlpools Below Sound (2014). Cold Blue Music CB0040 (1 CD) (http://www.coldbluemusic.com/). This collection’s title appears to have been lifted from a schizophrenic’s diary. Whatever, it’s an apt starting point for this hour-long ea journey. Despite the 19 tracks’ descriptive titles, a story remains elusive, offering rather a dreamy world of juxtapositions. Intelligible speech infrequently appears as garnish or background surface. One notable exception is an overheard conversation under guitar and arcade-like electronics in Carapace, rupturing the spell to convey its obscure message. Several tracks demand re-examination. Goldmine Nectarine with its light chimes, needle-in-groove static, and looped harp and strings, might be a behind-the-curtain moment stolen from a 1950s movie. I won’t be the only one to think of David Lynch. Then Deeper recalls the Italian expression “tanto tempo fa” (“a long time ago”). Not all tracks are nostalgic. The longest, Ashland Schine, with its recurring low rumble under lighter sine waves, is inscrutable. Perhaps we’re hearing reused materials.